England are closing in on victory in the first Test after setting West Indies 478 to win and then reducing them to 114-3 at the close on day four. Brian Lara (11) and Shiv Chanderpaul (four) were at the crease when bad light ended play at Lord's. England skipper Michael Vaughan scored his second century of the match before declaring with his side on 325-5. 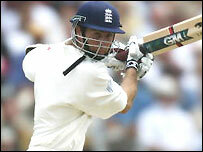 Vaughan shared stands of 116 with Graham Thorpe who hit 32, and 92 with Andrew Flintoff, who smashed 58. Vaughan became just the third batsman, after Graham Gooch and West Indies great George Headley, to score two centuries in a Lord's Test. The England skipper eventually declared with 34 overs remaining in the day, after Flintoff was caught behind off a top-edge. In reply, Chris Gayle hit 81, sharing a 67-run partnership with Lara, who contributed just eight. Gayle was eventually dismissed by Steve Harmison, edging a yorker onto his stumps. Ashley Giles and Matthew Hoggard had already claimed the scalps of Devon Smith and Ramnaresh Sarwan. England were already 223 runs ahead when the day began - and the loss of three wickets in nine overs during the morning did little to alter the balance of power. Pedro Collins took advantage of some variable bounce to york Marcus Trescothick for 45 and then induce an Andrew Strauss pull to midwicket. 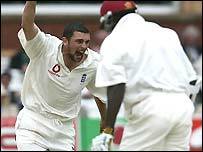 Robert Key was victim of a mix-up with his captain and was well short of his ground when Chanderpaul's throw came in from cover. I can't see the West Indians pulling this back, it will be all over by teatime! Vaughan and Thorpe batted as if in the middle of a one-day international, finding gaps in the field despite some tight bowling. And when left-hander Thorpe gave a return catch to off-spinner Gayle, the tempo lifted in typical Flintoff fashion. The all-rounder, who has passed 50 in each of his last five Tests, twice planted Omari Banks into the Compton Stand at long on. Left-armer Collins finished with 3-62 - and a total of seven for the match - when he induced a wild top-edge from Flintoff.